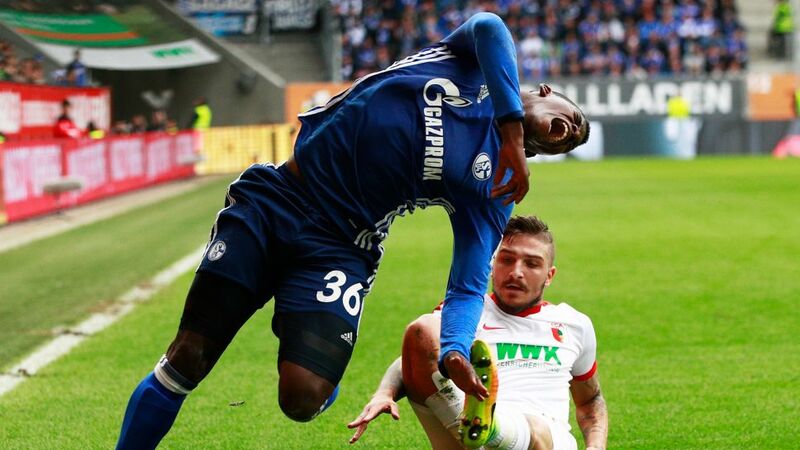 Embolo's afternoon was cut short after a dangerous tackle by Stafylidis. FC Schalke 04 striker Breel Embolo has been ruled out for up to six months after X-rays revealed a broken ankle and multiple ligament tears following his injury in the 1-1 draw with FC Augsburg. The Switzerland international was stretchered off on 24 minutes after a collision with Augsburg left-back Konstantinos Stafylidis, with tests on Sunday confirming the extent of the damage. Stafylidis has outscored Embolo in Official Fantasy Bundesliga points this season. Recruit him to your team here! "Everyone at Schalke is shocked by the injury," said Schalke sporting director Christian Heidel. “We've all seen how strongly Breel identifies with the club and, at just 19 years of age, has already developed into a very important player." “We’ll give Breel all the support he requires so he can come back stronger from this serious injury and pick up where he’s left off." Embolo has scored twice and assisted once in his seven Bundesliga appearances for Schalke since his summer arrival from FC Basel 1893. For more on FC Schalke 04's 1-1 draw at FC Augsburg, head to our brand new Match Centre!